Well, if it isn't one thing, it's another. After celebrating getting the A3S/A743 rotating again, I've found a problem. The SWR shifts I mentioned? On a dark night, I went outside and looked up at the antenna while WSJT-X was transmitting on FT8 trying to contact someone. I tried this on 40 and 20m. 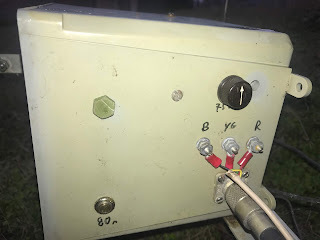 I observed one of the 20m traps on the driven element light up with arcing using 100 watts. It was visible in the drain holes and end caps of the trap. At the very least, I'll need to take the driven element down and rebuild it. Update: I've tried this experiment on 15m, and I see no SWR shifts even using 500 watts. I think the problem may be confined to the 20m trap(s). During my December vacation, I started a rather ambitious project on the tower. Since its installation, my A3S/A743 has been about eight inches from the very top of the mast. My intent was to put the beam at the very top of the mast, in order to give more room to stack an A50-3 under it. It had been a while since I climbed on the tower, and any work at the very top is always nerve-wracking. As I've written before, sometimes you get up there and decide you've had enough. Anyway, back to the December project. I conscripted my daughter Lauren to be my ground crew. I ascended the tower, removed the rotator and hung it from a couple of nylon loops off the side of the tower. Then I lowered the mast into the tower, until the A3S/A743 bracket was right at the top of the tower. The mast and antenna are somewhat heavy, weighing about 50 lbs. I relied on a pulley at the top and bottom of the tower and a haul rope to get support from my ground crew. The tricky part of this operation was going to be moving the antenna higher on the mast. I had two options. First, I could loosen the bracket U-bolts, lift the antenna higher, then retighten. This would only take me about five hands, and I was only born with two. Second, I could loosen the bracket U-bolts, then lower the mast into the tower. While this seems easier, I had visions of the mast going too low and the antenna falling off the tower. Plus, I was afraid that we'd drop the mast and it would fall some 40-some feet into the base of the tower. 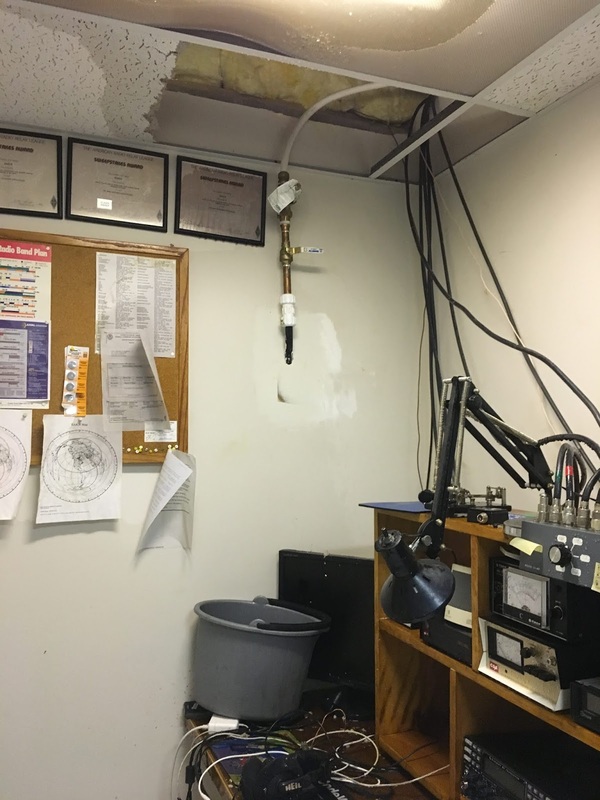 And then the antenna would fall off the tower. Plus, my daughter was having a lot of trouble getting sufficient leverage on my pull rope, which was 1/4". After being at the top of the tower a little over and hour, I decided to continue the project later. Little did I know that it would take two months before I could get back up there! In the intervening time, I had purchased 120 feet of 9/16" braided black poly rope. Our first order of business was to replace the existing 1/4" rope with this much more substantial lanyard. Once again with my trusty ground crew, we set out to complete the project. With the bigger haul rope installed, I surveyed the top of the mast. 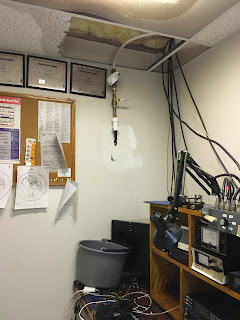 I had thought that perhaps the antenna had slid down the mast in the 18 years it has been up. But a close examination of the mast showed no evidence of that. It had always been at that level. Standing there 40-some odd feet in the air, 20 feet above the edge of my roof, I wondered if loosening the antenna would get me into a whole new world of problems. I decided at that moment I wasn't going to mount the A50-3 under the larger beam. What we needed to do was hoist the mast back and up and put the rotator back in place. This proved to be a problem. Despite all her hauling away on the rope, Lauren was unable to raise the mast any significant distance. It was only with me grabbing the mast with two hands and pushing we were able to move it at all. I ended up locking down the mast with a couple of bolts in the tower and climbing down to solve the problem. I had a ratcheting come-along, but hauling it up and using it on the tower was problematic. I ended up tying the come-along to a support pole, then hooking it into the haul rope via a tied loop. This would allow Lauren to use the come-along to provide lift, and I could manage things at the top of the tower. After climbing back up, things moved a little more quickly. The come-along provided plenty of tension, but I found that I had to move the mast with my hands to get it to budge -- there's just too much friction and too much stretch in the poly rope. In a few minutes, we had the mast nearly back up into position. I had to re-position the pulley to get the last few inches to make room for the rotator. With the mast locked down again, I hauled the rotator back into position. Thereupon I discovered two problems. First, one of the four nuts on the U-bolt that clamps the rotator to the mast was missing. In the two months on the tower, it apparently shook loose and fell off. Second, the rotator connection at the base of the rotator were loose -- one of the forked lugs had fallen off the wire and would need to be replaced. Not having the necessary hardware at the top of the tower, I finished as much of the assembly as I could and came down the tower knowing that this project would be finished on another day. Hopefully, it won't take a couple of months to get back up there. right, relay is black box just above. 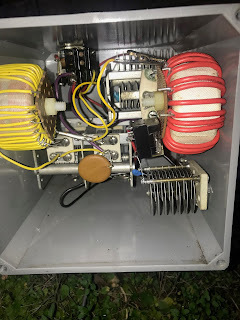 Three years ago, I improved my shunt-feed matching network for 75m by upgrading to a T200A-2 core and a way more beefy variable capacitor. It tuned my shunt-fed tower quite nicely to a 1:1 match around 3800 kHz. And it could easily handle a little bit of power. However, when using the antenna on the low end of 80m, the match isn't quite so nice, reaching nearly 3:1 at the bottom of the band. I needed to be able to re-adjust the network when operating there. It occurred to me that additional capacitance would do the trick, along with a way to switch it in. I found good capacitor of about 25 pF and suitable plate spacing. Switching it was more of a problem. I wanted to use a large, 12 volt, open-frame relay. Unfortunately, I didn't have anything in my junk box, and couldn't find anything I liked at a hamfest. Eventually, I settled on using a PC board style relay. I figured it had enough of a contact gap to avoid arcing. Mounting it, however, was problematic. I ended up just having it floating in the box, suspended by the wiring connections. tuning control (upper right) and the 80m tuning. 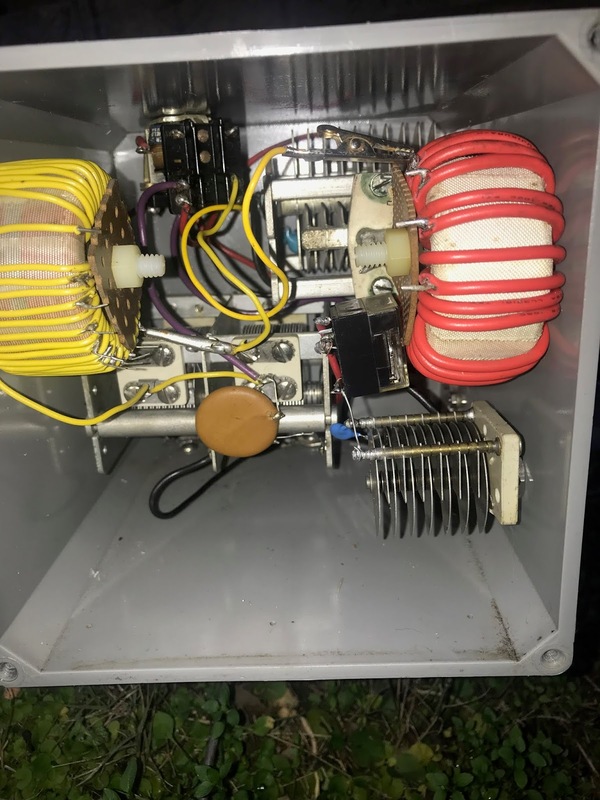 After re-wiring, the network tuned up nicely on 75m, but there wasn't quite enough capacitance to bring the match down in the CW portion of the band. I ended up putting to 33 pF 6 kV capacitors in series across the 25 pF variable, essentially adding 16.5 pF to the circuit. That did the trick, and I got a 1.1:1 match around 3570 kHz. VSWR at the bottom edge of the band was under 2:1. The existing four-wire bell cable control lines were re-purposed to drive two relay circuits. The existing frame relay selects between the 75/80m and the 160m matching networks. The additional relay is energized to bring the additional capacitance online for 80m. This works so well, I'm surprised I didn't try it earlier. With a better match at the antenna, losses in the feed line and antenna tuner are reduced. Odd things happen. During a long DXpedition, like the current VP6D expedition to Ducie Island, they are bound to happen. They happened during the K1N Navassa Island expedition, for example. Last night I'm trying very hard to put VP6D in as many DXCC slots as I can. I hadn't worked them on 30m, and they were running RTTY. 30m is often tough, since everyone runs 200 watts, tops, and my 100 watt signal doesn't really stand out. RTTY makes it even harder. I called for a half an hour with no luck. And then VP6D disappears. I continue calling for a little bit. It's a sort of anxious hope that sometimes works. Maybe they had a generator die, and the first thing the operator will hear when the generator comes back to life will be my callsign. Right? Well, it could happen. After a couple of minutes I stop calling. I'm sitting there with the headphones on. The left ear is listening to 10142 kHz at about 450 Hz wide, the right is listening up around 10144.5 kHz, about 2 kHz wide. And, I'm hearing nothing. Nothing at all. About three minutes after I stopped calling, I heard a signal. It sounds like a CQ. A CW CQ. It's off frequency, so I can't really tell. I'm not set up for CW. I'm in DATA mode, with settings all flipped around with wide filters. But - there it is again - in my right ear, it sounds like VP6D calling CQ, in CW. Switch things around to CW, with a narrow filter, and then tune for the right frequency. I'm sure I'm going to miss it, but no, I find him. There he is CQ VP6D UP2. Plain as day on 10144 kHz. That's not where you'd expect him to be at all. No, the published CW frequency is 10105 kHz. This frequency is out of position for CW, but there he is, calling CQ VP6D UP2. And no one is answering. No one. This is my chance. I go into split, up 2, and give him a call. But, again, CQ VP6D UP2. A couple of times. No answer. So, I figure, hey, maybe he's actually listening up 1 and doesn't realize his memory keyer doesn't match. I dial in up 1, and call. No dice. After a few calls, I wonder where he's listening really. Maybe he's listening up 2 from 10105 kHz. I give him a call on 10107 kHz. Nothing. Perhaps he's listening on his own frequency? At this point, he's been calling CQ on 10144 kHz for two solid minutes and no one has answered him. I figure it's worth a try without being a DX lid. I turn off split and dump in my call: AA4LR. AA4LR 5NN comes the response. R 5NN TU, I reply. And bam, quick as that, he's in the log. He goes back to calling CQ VP6D UP2. I listen for a couple more minutes, but no one is calling him. I post a spot on dxwatch.com and listen for a couple more minutes. Still no one. I begin to wonder if he's just clueless to where he is in the band, and that no one is looking for him there. So, I dare to send again on his frequency: FREQ? He responds to my question by sending 10144 twice. So, yeah, he knows where he is. I post another spot, hoping some other DXer will find him, too. After about 10 minutes of this, he goes silent. A minute after, I find him down on 10105 kHz, once again calling CQ VP6D UP 2. And, people are calling him, and he's answering. Good, that's what's supposed to happen. Looks like I'll may be the only one who worked VP6D on 10144 kHz CW. Cool. At the end of summer every year, I start thinking about DXCC. For several years, it was getting more confirmations for 80m DXCC, so I could complete 5BDXCC. Last year, I accomplished that, including the 30m endorsement. At the time of this writing, I have 109 confirmations for 17m. That band will be next - I'll submit that this year. This will also push me over the 1000 confirmations threshold for DXCC Challenge - I'll do that one at the same time. The downside of earning DXCC awards on each band is there are fewer bands left. On 12m, I need just 17 more confirmation. Given the low level of sunspot activity, that might take some doing. However, I did manage to add 10 confirmations since last year, so it is possible. 160m would be the next one. With 46/45 confirmations, it's further off. I'm not even half way to the necessary 100. I will definitely put some work into 160m this winter. But, honestly, DXCC on 160m may take a few years. Speaking of years, on 6m I have a whopping seven confirmations. In the spring, I figured out how to use FT8 on this band, and while I heard a ton of DX, I only managed to work a handful. Definitely looking forward to the winter sporadic-E season. I think the most excitement I'll get for a while is finishing off 10-band confirmations. I have USA, Canada, Mexico, and Suriname on all 10 bands -- but there's several countries where I just need a 6m contact. I've inched closer to Honor Roll, with 279/276 confirmed Mixed. have worked about nine of the remaining 64, but I need confirmations. Perhaps it is time to learn more about QSLing effectively. And, if nothing else, it's fun building endorsements for the bands I already have. That's the fun of DXing -- it's long-term fun.